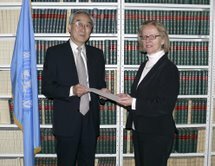 UNITED NATIONS, April 6 -- In a little-noticed ceremony last month, North Korean diplomat Pak Tok Hun signed his country onto the UN's Convention on the Registration of Objects Launched into Outer Space. A photograph was taken, of Pak Tok Hun with the chief of the UN Treaty Section, Annebeth Rosenboom. Assession document here. Four weeks later North Korea would launch a Taepodong-2 missile over Japan, triggering Tokyo's request mere minutes later for an urgent meeting of the UN Security Council. As reported in real time by Inner City Press, Japan's request was quickly granted, and an April 5 meeting held. But at the meeting China, Russia and other non-permanent members of the Council argued that North Korea was entitled to use a Taepodong-2 missile to launch what it said was a satellite "into outer space." The little-noticed signing because significant. Why was it not more noticed at the time, including by UN Secretary General Ban Ki-moon? Several UN member states are asking the question. Meanwhile on Monday in the UN, the Deputy Permanent Representatives of China and Russia were seen shaking hands outside the meeting of the Permanent Five members and Japan. This was seen as making the sanctions resolution requested by Japan less likely. The U.S. says it is strongly supporting Japan's request. But diplomats from Sudan and Cuba, among others, are gleefully questioning the U.S.'s commitment to Japan, sources say. They say the U.S. has become more concerned with China, including for business reasons. If the Japanese electorate become more disillusioned with the UN, these sources ask, will the country unquestioning keep up its status as the second larges donor to the UN?